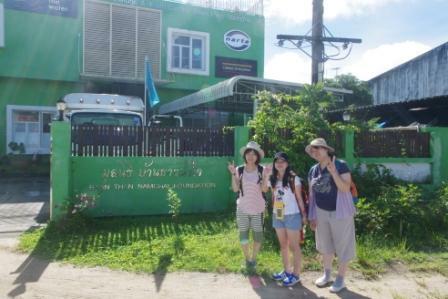 A group of three enthusiastic Japanese Students arrived in Thailand to participate in a study tour. This is the fourth time that this great collaboration between Takashi Higashiyama and Andaman Discoveries has taken place! 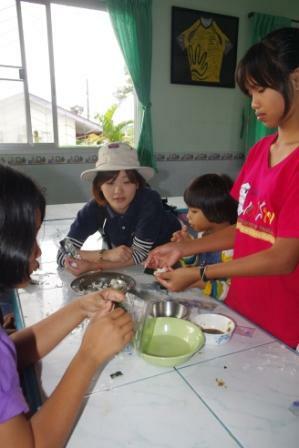 The goal of the tour was for the students to learn about the relief aid that took place in Thailand after the Tsunami so that they could bring this knowledge back to Japan. Andaman Discoveries shared with them about the different projects and communities we support! 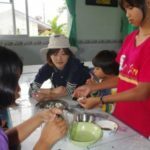 They were given an all encompassing, hands on, interactive tour of these communities and projects with an Andaman Discoveries staff member leading the way. They visited a local temple to talk with the monks about peace of mind in a time of crisis. Then they visited Ban Tan Nam Jai Orphanage and stayed at Ban Nam Kem youth center, which is a nursery for kids that were displaced after the tsunami. They spent meaningful time with the kids and learned about how the Orphanage is run. Their next stop was at the Saori Project, an occupational weaving group that was set up after the tsunami as a way for people to express themselves through handicrafts and encourage self-development. 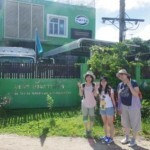 The last stop was a homestay in the small fishing village of Ta Pa Yoi on the island of Koh Pratong. Here, they stayed with families and participated in local activities like kayaking through the picturesque mangroves, making squid traps, swimming and offering food to the monks. They also took a tractor ride across the island’s savannah to have lunch and pan for tin at the nearby village of Tung Dap that is home to the Moken People. The tour allowed everybody to connect by sharing experiences and knowledge all while laughing and having a great time! That’s a good thing to learn in a study tour. It’s amazing how they showed love to the needy. Thanks for sharing this wonderful story.